I love that Goodell even mentioned the Key and Peele sketch with Hingle McCringleberry’s excessive celebration. He tweeted, “Don’t get any ideas about pumps @KeeganMKey – they’re still not OK under the new policy #FootballisFamily.” Goodell also announced the NFL would shorten overtime. The Cleveland Cavaliers took a 3-1 lead over the Boston Celtics in the Eastern Conference Finals thanks to Kyrie Irving. LeBron James got into some foul trouble in the first half, but Kyrie stepped up with a huge 42 points. As Irving put it, “You almost hit the … runner’s high. Where you get so juiced up when you see a few shots going in and then you feel emotion kind of take over. … That’s an incredible zone to be in, which I was tonight.” Cleveland could put the series away in game 5 Thursday night 8:30 pm in Boston. Cavs 112, Celtics 99. 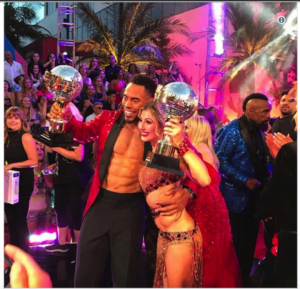 Former NY Giants NFL running back and current free agent, Rashad Jennings, edged out former Chicago Cubs catcher David Ross to become the newest “Dancing with the Stars” winner. Jennings said he has no doubt he’ll be back on an NFL team, but will continue his cardio while training for the “Dancing with the Stars live tour”.